The ZIP 47G combines a hi-resolution color display and dual Gigabit Ethernet ports, in a feature rich IP phone ideal for busy executives and heavy phone users. Functions and contacts may be accessed quickly via 27 programmable soft keys. A dedicated headset port and Electronic Hook Switch support offer enhanced usability for wired and wireless headset users. The optional ZIP 440M Expansion Module supports additional programmable keys. 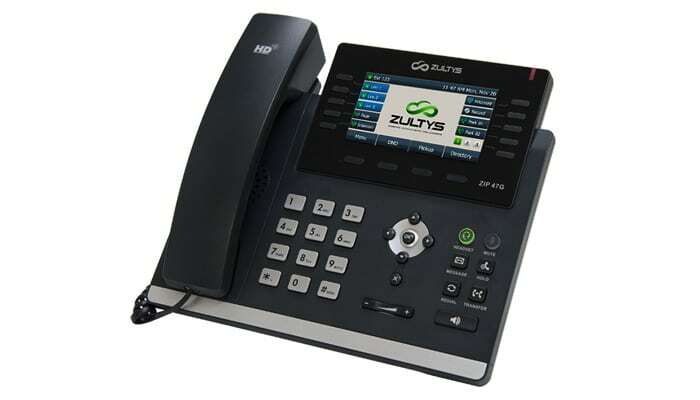 The ZIP 47G is fully compatible with Zultys’ MXIE and ZAC Unified Communication applications, allowing users to manage calls and messages directly from their computer. Like all Zultys phones, the ZIP 47G utilizes the Session Initiation Protocol (SIP) open standard and is managed from the Zultys MX Administrator application for rapid deployment and the industry’s lowest total cost of ownership. The 4.3” hi-resolution 480×272 pixel color display of the ZIP 47G provides detailed call information accompanied by dynamic icons to minimize training requirements and maximize usability. Ten LCD labeled buttons support up to 27 programmable keys (3 pages of 9 keys). Key alert feature ensures that users are instantly alerted to Busy Lamp Field (BLF) and new call events. Four context sensitive soft keys below the display make conferencing, transfer and other operations a breeze. The ZIP 47G may be combined with up to six ZIP 440M Expansion Modules to facilitate up to 240 LCD labeled programmable keys, making it ideal for operators and receptionists. Staff requiring mobility around the office will appreciate the convenience of the Electronic Hook Switch control when the ZIP 47G is combined with a compatible Wireless Headset and EHS 3xi adapter. The ZIP 47G may also be used with a compatible Bluetooth headset when combined with the optional Bluetooth adapter. From initial deployment and configuration to future enhancements and upgrades, the Zultys ZIP 47G is designed to save your business time and money. Dual auto-sensing Gigabit Ethernet ports, with integrated IEEE 802.3af Power-Over-Ethernet (PoE) support, eliminate additional wiring and simplify installation. Zultys’ leadership in SIP open standards IP telephony for over 10 years provides peace of mind and investment protection.